On April 22, the First of Season (FOS) Broad-tailed Humming-bird visited the feeders I'd had out for a week. Yes, I'd changed the nectar once, as the week was quite warm and I know it will go bad in just 3-4 days. 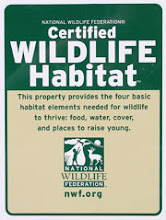 For the first few weeks as they arrive, as well as the last few weeks before they leave again, I always prepare smaller amounts of nectar and make it slightly stronger (with a bit more sugar than 4/1 water to sugar) and only add a few ounces to each feeder. With this practice, I both toss less out between feeder-changes AND I ensure the birds are able to get the calories they need during migrations through these mountains both coming and going. What I found interesting is, April 22 was the same day last year, that I found my FOS Broad-tailed Hummingbird! If all follows that pattern, I should see a Black-chinned tomorrow, as they seem to follow the BTs by a few days; last year, the FOS BC hummer was spotted on April 25th. I'll keep my eyes peeled! The photo is from Wikipedia. 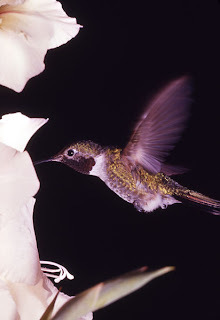 Remember, a hummingbird's color is determined on how light shines on feathers. Sometimes a chin will look black, but if the sun shines on the bird straight-on, the color will be brilliant. In fact...male hummingbirds will make sure the sun is behind the female for whom he dances, ensuring the very best shine to impress her with his most dazzling colors. As always, click the labels below to see more posts and photos on the topic. Wow, what a Good Friday! I feel sort of bad because my boss gave us the afternoon off, but due to expected snows...I opted not to drive the nearly 40 mile round trip to work for a couple of hours and to stay home today. Besides, three small groups of folks had said they were coming to chance the possibility of late Rosy-Finches. Unfortunately, while a few of the last pink-butts were here very early...they were gone by 9 o'clock. As I edit this note...they no longer come; the season is over. Four solid months was great fun, though. One might think I am the epitome of the 'good neighbor' or 'generous person' inviting everybody to come see the birds in my yard, but there ARE extenuating circumstances. First of all, the birds in my yard are a blessing of sorts. Rosie-Finches in particular are often hard to find and I've had them in my yard daily since December; and in great numbers. How cool is that? Secondly, I learn SO much from the folks who come here. Case in point...Stan and Becky were here, first time they actually came into the yard; they usually bird just up and down the street. But, having met them in front of my house and their pointing out a Brown Creeper in a tree in my front yard was a first for me! Lovely people and way knowledgeable, too; who knew I had Creepers? A bit later another birder arrived. 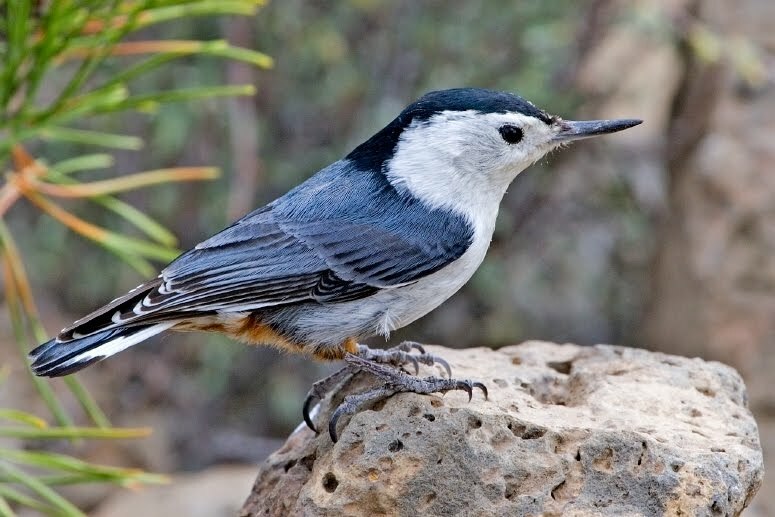 Duane pointed out a Red-breasted Nuthatch that was coming and going from a feeder. I've been telling folks "Nope, not here...only outside of town." Sheeshh! Yet another first! This Red-breasted sweetie clearly has a rufus-wash over his front, but Duane also pointed out how much smaller this bird is than his cousin; almost a third smaller, with a much shorter tail. 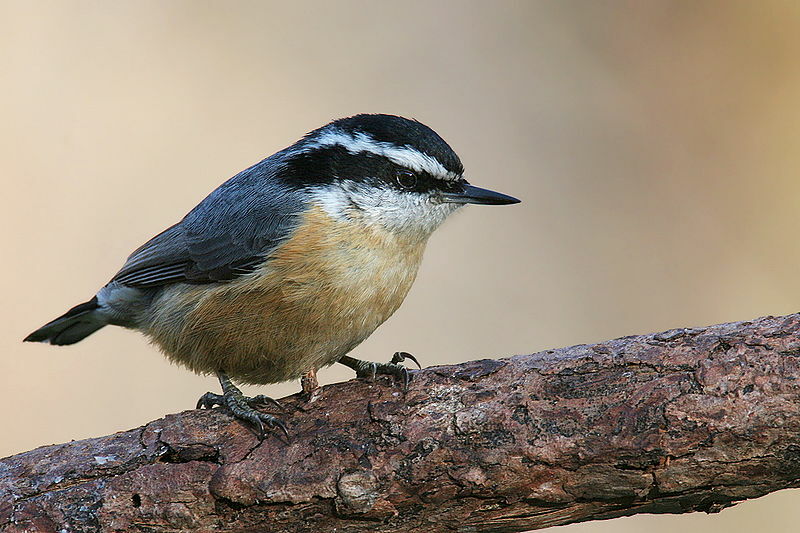 And then there is that face; so much like a chickadee with the white eyebrow and that much stubbier bill. I imagine they've been here all along, but I just didn't know what I was seeing. 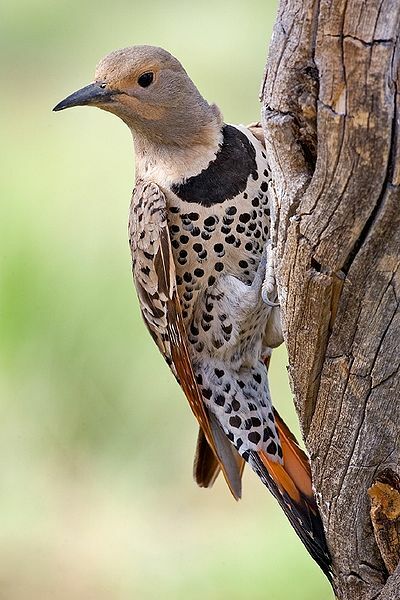 And then later in the day, while Ira and his wife Tammy were here, Ira spotted a Northern Flicker on the ground. She sat for quite awhile while we watched her. Immediately Ira pointed out her face had very little brown...and suggested it might be a Yellow-shafted. 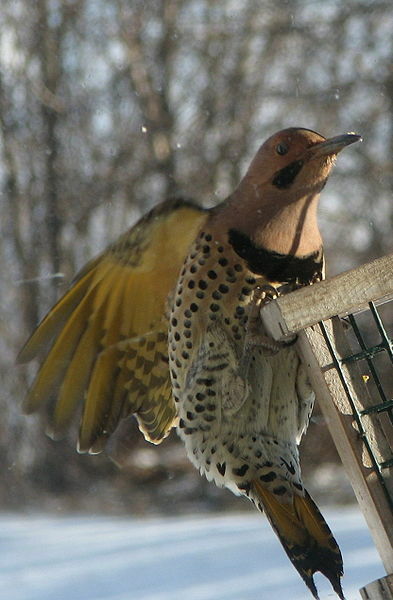 Tammy and I watched her till she finally flew; and yes another first; a Northern Flicker - Yellow-shafted variety. Good call Ira! While the photos show a male Yellow-shafted and a female Red-shafted, if all one notices is the underside of the tail, it is easy to tell these birds apart; but I'd never seen one. I know I miss identifying some birds because I'm new, but just not to see them is a shame! Got a first today...in my yard...twice! There is a third thing...perhaps the most important; to me, anyway. That is a certain amount of socialization in this very rural area that I moved just a few years ago. I tell my brothers in California that birding keeps me off the streets; I'm only half kidding. There is a good degree of sanity that comes from relationships; friends and acquaintances...not to mention people of like minds who sort of validate and support a hobby. Doncha think? At the very least, I can say I've met the several many very interesting people by opening up my yard to birders...and I've learned a lot. 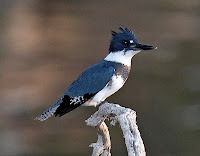 Just today I added the Red-breasted Nuthatch to my yard-bird list, I actually SAW (rather than just heard) a Belted Kingfisher, I got to point out the FOS (first of season) Common Grackle here, got the first Yellow-shafted Flicker, witnessed a couple Great Blue Herons fly over and got two 'duck' flyovers identified: Gadwalls and Northern Pintails. Perhaps no big deal to many, but I can only identify a handful of waterbirds. 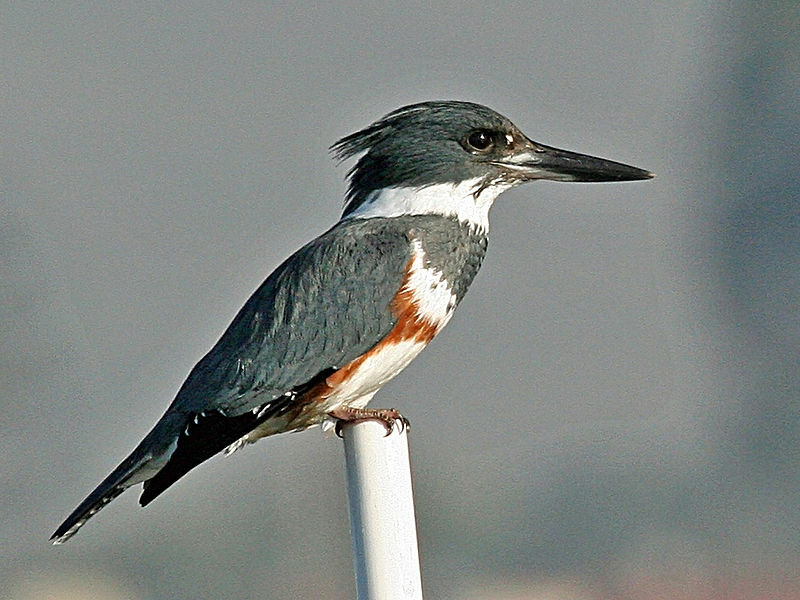 Something else pointed out to me today, the female Kingfisher is more colorful than the male. She has two breast-bands; the wider blue one and the more narrow, red one, below. A male Belted Kinfisher just has the one, blue/gray band across his front. While these photos don't show it well, both sexes have the same, dark blue coloring. So there ya have it; I'm really not so nice...I just have so much to gain inviting all these wonderful people into my yard. Today was a really good Good Friday. And while I believe this is the last weekend the Rosie-Finches will be here...this is yet another first: first time they lasted till April! I'm a bit chagrined though; not a single person got to see the Rosies today; they come and go earlier and earlier these days...and today stayed only an hour or two. Belted Kingfisher, Turkey Vulture, Red-tailed Hawk, Song Sparrow, Western Scrub Jay, Western Meadowlark, Great Horned Owl, Pine Siskins, Common Raven, Red-winged Blackbird, American Robin, Lewis's Woodpecker, Cassin's Finch, Evening Grosbeak, Black Rosy-Finch, Brown-capped Rosy-Finch, Gray-crowned Rosy-Finch, Blue Jay, American Crow, White-winged Dove, American Goldfinch, White-breasted Nuthatch, Mountain Chickadee, Hairy Woodpecker, Black-capped Chickadee, Dark-eyed Junco, House Finch, Northern Flicker - Red-shafted, Downy Woodpecker, Black-billed Magpie, European Starling, House Sparrow, Eurasian Collared-Dove.